22. Amanda Hesser- The New York Times food writer’s genius Food 52 combines blog with community with recipe trove with contests with shopping. Oh, and her Essential New York Times Cook Book won the 2011 James Beard Award in the General Cooking category. When I hear the name Amanda Hesser, I think simply Food 52. It's not a place I've spent much time in the past, but I know lots of people who have and who have earned a place in the Food 52 cookbook. She grew up in a family where everybody cooked. She is the former food editor at the New York Times. She wrote the latest edition of The Essential New York Times Cookbook (following in the footsteps of the great Craig Claiborne). Many of you may recognize her from Julie & Julia...she played herself in the movie adaptation of the book. Her name is synonymous with food and I'm happy that this has given me a chance to learn a bit more about her. Combine cranberries, sugar, and water in a saucepan and bring to a boil. Boil until cranberries are soft and start to pop, 5-10 minutes. Transfer to the jar of a blender or food processor and puree. Pour into a jar. Add vodka and cinnamon sticks. Refrigerate for at least three days and up to several weeks. Strain through a sieve (use fine mesh lined w/ a cheesecloth if you don't want any straggling seeds) before serving. Refrigerate or store at room temperature for up to a year. 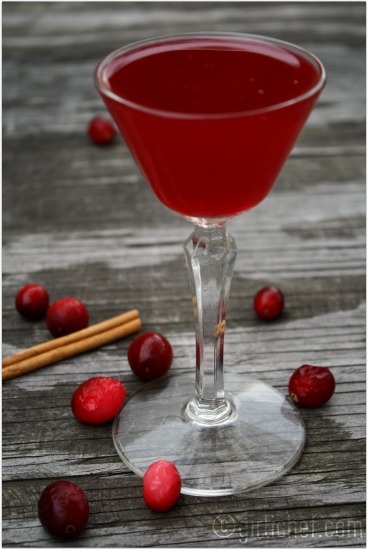 Cranberry Cosmopolitan (from Cooking Light Annual Recipes 2004 ): Place some crushed ice in a cocktail shaker. 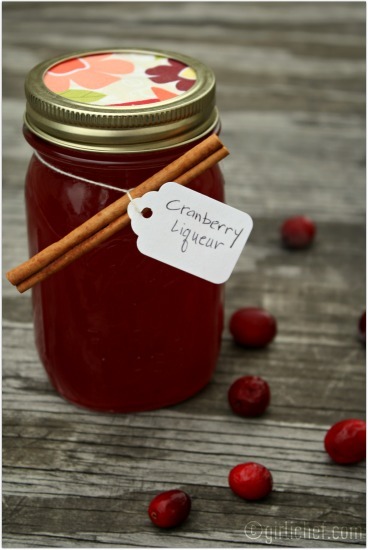 Add ½ cup Cranberry Liqueur, ¼ cup Cointreau, & 2 Tbs. freshly squeezed lime juice. Shake it up and strain into 2 martini glasses. I like the idea of making it to give as a holiday gift. 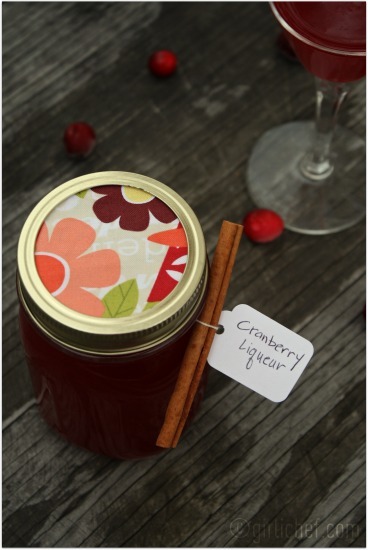 Bottle it or jar it and put on a pretty label with instructions for storage on the back. I'm not familiar with her (and I saw Julie and Julia on a plane so I missed some details!) but this looks absolutely gorgeous. It'd be a good base for my Christmas champagne cocktails. This looks like something I would love! Great idea on making it Christmas gifts. Okay, so I made cranberry liqueur last year and it was basically buy some vodka, pour it in a container, slice cranberries in half and add to vodka, then let steep for about 30 days. To be honest, it was disgusting! This recipe is 100 million times better. I definitely think the sugar in this recipe would make the difference. I was so excited to see this ever since you said you were going to make it. What a color. I want to make it and serve it at Thanksgiving, but it would make a great holiday gift, too. Maybe I could use it in my cranberry sauce, to 'kick it up a notch'! As I stroll along the posts of the 50 Women in Food, I find again another recipe I missed in their book. Absolutely stunning Heather. And just in time for the holidays. Super idea, Heather, and in time for Christmas, too. The color is gorgeous. I did something similar with rhubarb, but it took a year in the fridge! It's ready to use now though. Hesser's NY Times cookbook is indeed amazing - both delicious and so readable. Never thought to do the liqueur... but it's never too late. It's so very pretty. What a beautiful homemade Christmas gift this would make - love the color! Thank you for introducing us to her! I love this, it is similar to Lemoncello, except it doesnt take as long.I printed it out. I may make this and give it away for christmas. Thanks for sharing. Such lovely photos - they look like pieces of art never mind the yummy cranberry drink! I can't believe how easy this is, I don't know why I thought it would require more ingredients or be harder. 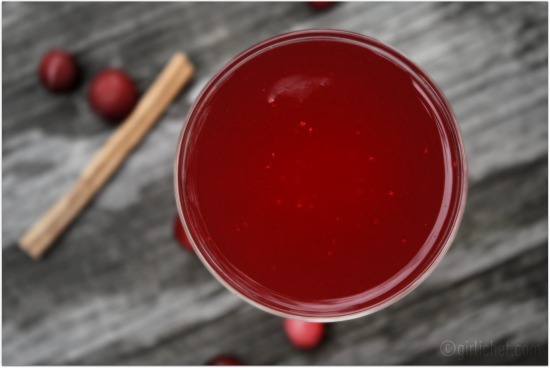 I can't wait to make some cranberry cocktails, that cran cosmo sounds great, or even just add cranberry juice for a super Cranny Cape Cod! I love it!! It make a really nice gift. Gorgeous pictures--and looks soooo good. Just ordered 10 lbs of cranberries, so I may need to do this for a holiday project! well, forget cranberry juice with vodka as my favorite drink...this might just revolutionize my life! I went though a liqueur making phase a long time ago. This post makes me wonder if I should go through another phase. What a neat list. I'll be looking forward to more of your posts. Thanks. I was thinking the same thing as Lisa - this would be a great cocktail for Thanksgiving. On that day, most people love cranberries. I'm enjoying your posts on the 50 Women. I think I have found the cocktail I am going to serve at our Thanksgiving dinner. Thanks! What an awesome idea to cook the 50 game-changers. I remember that article in Gourmet. 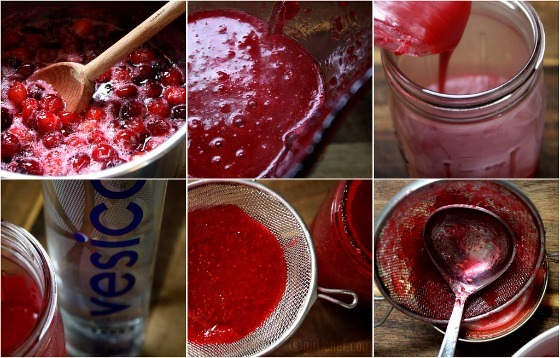 Anyway, I think I need to make this.I love cranberries. I've made blackberry and blueberry liqueur but never cranberry. I bet it's delicious. I saw a similar recipe in Yankee magazine years ago and always wanted to make it. Maybe this year! Yeah, it would have been easy to miss her then...it was just a quick cameo, I believe. Thanks April, I linked up! That's strange...aren't liqueurs usually sweet? That just sounds more like a flavored vodka. I don't think you'd be disappointed with this one. Oh, I was thinking the same thing! Oh, definitely! I found that topping it off with a good splash of club soda is really tasty, too!! I must have scrolled right past this. This is PERFECT for a Thanksgiving cocktail. Will definitely be making for our feast this year! LOVE the deep red/cranberry color!